This is our house brand DVD-R media, we call it Gotmedia DVD-R. We have built special releationships with manufacturers over the years and this has helped us bring a great quality 16x DVD-R to our customers at incredible prices. 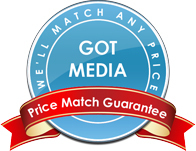 Our house brand Gotmedia DVD-R is no exception to bringing quality at an affordable price. We import these DVD-Rs in plain wrap packaging so that we can keep costs low, but the quality is not plain at all. This is an excellent performing 16x DVD-R with great compatibility and stability. We stand behind Gotmedia DVD-R since this is our house brand. Try out our Gotmedia DVD-R, we are sure you will not be disappointed. They are DVD-R media and available in 16x speed. Gotmedia DVD-R is backwards compatibile with slower drive speeds like 8x and 4x. They come with a Shiny Silver top surface and White Inkjet Hub Printable.